14.3 x 11.4 x 7.5 cm. 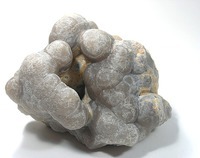 A massive, dramatically sculptural, old-time smithsonite from this classic mining district of Arkansas. The translucent, gray, bubbly botryoids have waxy lustre and the secondary coatings of cadmium-rich smithsonite really adds color and character to this amazing piece. I have never myself seen a piece like this, as they were found a long time ago and simply are not available in any collection I know of to view. The Morning Star Mine was the first discovery of zinc ore in the district in the 1880's. Extraordinarily large masses of smithsonite (to 12,750 pounds = about 5,800 kg) were encountered here (MINDAT). This one came out of the Seaman Museum, where it had originally been part of the collection of Prof. William Heinrich. Ex. James Zigras Collection. Weighs 4.2 pounds or 1.9 kilograms.